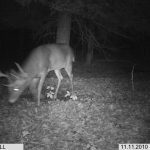 It is now the third week of June, and I have received 15 orders for buck preorbital in the last week to set up trail cameras for licking branches. Pick a travel lane or corridor to funnel deer through the area. Put on a pair of latex gloves, pick a sturdy limb 4 to 6 feet above the ground, and crush the tips of the branch. 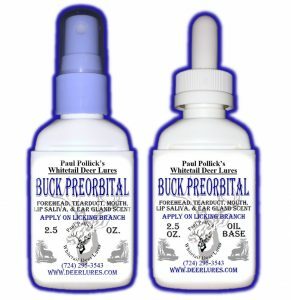 Spray the broken tips with Pollick’s Buck Preorbital head gland scents. 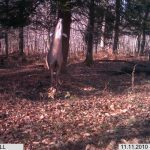 Now place a couple dry sticks or pieces of bark on the ground below the preorbital licking branch and spray them with buck interdigital hoof gland trailing scent. You have now successfully created an authentic licking branch. Authentic Buck Preorbital gland head scents are key to the success of the licking branch, not urine. 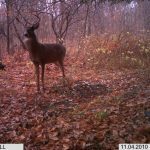 Save the deer urines until pre, peak, and post-ruts when deer are compelled to check urine for sexual advertising scents and pheromones. Email us at paulpollick@deerlures.com and send us some pictures of your nice pre-season licking branch buck with a short description of your setup. We won’t tell anyone where your trophy is hanging out! And if you shoot him this season, we will put his picture of success on our website. Enjoy your pre-season scouting. Enclosed are the photos using all your scent products. You can see from the photos how interested the deer are and I even had a coyote and bear come to the same spot I put the deer scent.. I used the preorbital on the the branches where the deer were bitting at them and I used the buck and doe interdigital , buck and doe tarsal and urine scents in the scrapes. I had a few oportunities to take two of those big buck with the bow but I was too impatient and lost having a good shot, took too far of a shot. I was on the ground and the deer seemed closer then they actually were so I missed. I just put my cams up today , I start without using scent to see if anything is passing by , then in the next month or so I start putting the scent down to get them where I want and keep them comimg in. I dont use too much but enough to keep them interested. I plan to use a tree stand this year at the sight of that big eight, I think he is still around. 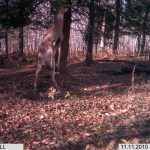 POLLICKS DEER SCENTS ARE SIMPLY THE BEST I HAVE EVER USED IN MY 40 YEARS OF DEER HUNTING – AND BELIEVE ME I TRIED THEM ALL! Want to hear more from Paul? 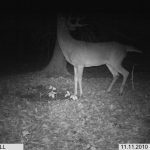 Click here for for new & updated tips, articles, and write-ups that may be of interest to whitetail deer hunters.